Prototype: German Railroad, Inc. (DB AG) class 401 ICE 1 InterCity Express high-speed train. Current version. Sound in both powered end cars. LED headlights and marker lights. Model: The train is a five-part version. The first powered end car has a built-in digital decoder and sound generator for operation with DCC, Selectrix, and Selectrix 2. It also has a motor with a flywheel. 4 axles powered. Traction tires. The LED headlights and LED marker lights change over with the direction of travel. Warm white LEDs are used for the lighting. The headlights, marker lights, and the cab lighting can be controlled digitally. The second powered end car has a built-in function decoder and sound generator. It also has LED headlights and LED marker lights that change over with the direction of travel. Warm white LEDs are used for the lighting. The headlights, marker lights, and the cab lighting can be controlled digitally. The intermediate cars have built-in interior lighting. Train length 753 mm / 29-5/8". 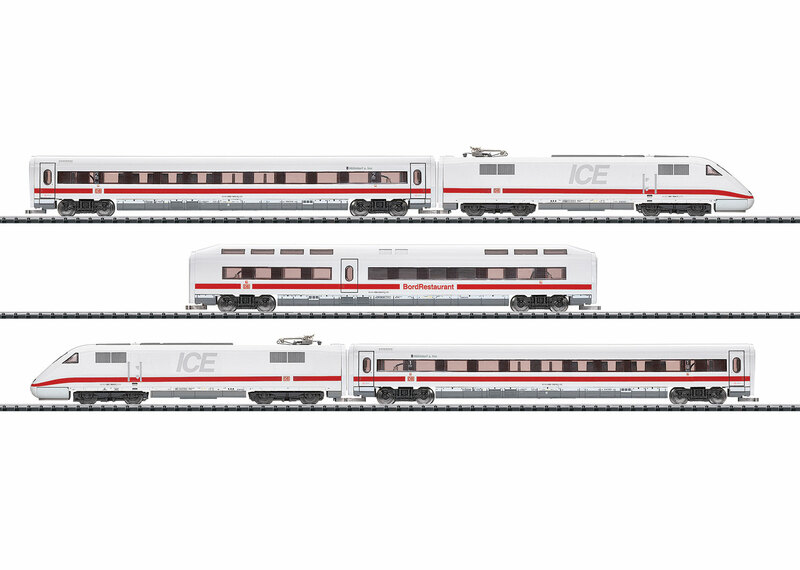 The ICE 1 stands for the beginning of scheduled high-speed service on track and roadbed built just for it in Germany. Other intermediate cars to go with this train are available in a set under item number 15941.